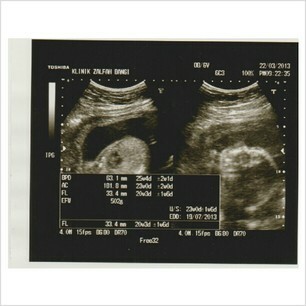 Alhamdulillah, our baby is now almost 6 months (23weeks and 4days to be exact). Ya Allah, time flies so fast doesn't it!! Subhanallah, it was so amazing, to see how much our baby has grown. The doctor showed us everything, from the chest, heart, legs, hands, spine and the most exciting, our baby's face! I was super duper happy to see our baby's face in the ultrasound, even though it was just from the side profile. Also, the doctor said it will probably be a boy!! Hehe:)) And baby has been very actively kicking in my tummy ever since! I told my parents and they were very excited to hear that the baby will be their first grandson(if it's really a boy!) All in all, it's a healthy 500gram baby Alhamdulillah. Expected due date is end of July 2013 (19-28th). congrats aishah...semoga selamat sampai deliver na..
Alhamdulillah. hopefully sis aishah and your baby will be in a good condition. amin. congratulations. Alhamdulillah! Im so happy for you! Take care sister! <3 guess we all will be waiting for the baby updates and more! ;) yeah! Mubarak on your pregnancy. Good luck with the rest of your pregnancy and may you Insha Allah have a healthy baby and easy delivery. Mashallah sister, what exciting news. I to am expecting and due in july with a boy! May allah make both our deliveries health and easy!